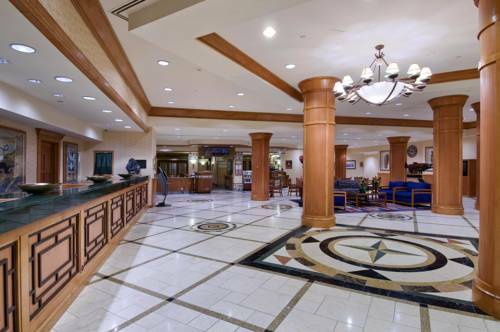 Located in the heart of Downtown Anchorage Alaska the Hilton Anchorage hotel stands out for its convenience and comfort. This Hilton hotel is just a 10 minute drive from Ted Stevens International Airport one block from the Alaska Railroad Depot and within walking distance of the Anchorage Convention District. The Hilton Anchorage hotel is also within walking distance of over 100 dining options in and surrounding the downtown area. Our very own Hooper Bay Cafe is an open-air full-service lobby restaurant featuring the Hilton Breakfast two private dining areas and a Starbucks Coffee Kiosk. This Hilton Anchorage hotel is just two blocks from Ship Creek fishing opportunities Flight-Seeing Operators and Tour Companies Alaska Museum of History and Art The Ulu Factory Nordstrom and the 5th Avenue Mall. The Hilton Anchorage hotel has an inviting lobby enriched with an extensive Alaskan art collection complete with a self-guided walking tour. The hotel guest rooms have magnificent views of the Chugach Mountain Range Cook Inlet or sweeping Anchorage vistas. The Hilton Anchorage hotel Fitness Center includes a complimentary health club equipped with Fitness by Precor an indoor heated swimming pool and steam rooms. Hilton Anchorage hotel guests may enjoy the spectacular view of Cook Inlet and the Alaska Mountain Range while exercising on state-of-the-art equipment. The Anchorage Alaska business traveler will enjoy the Hilton*s comfortable and functional rooms appointed with efficient work areas complete with data ports and high-speed Internet access /HSIA/. The Hilton hotel 24-hour self service business center offers full PC access high-speed Internet laptop stations with wireless or hard wired Internet access as well as printing faxing and copying options. The friendly staff at the Hilton Anchorage hotel is ready to welcome you with Alaska*s warm hospitality. Welcome to the Hilton Anchorage Alaska Hotel. Travel should take you places. A CREDIT CARD GUARANTEE IS REQUIRED ON RESERVATIONS FOR ARRIVALS AFTER 4PM/1600 LOCAL HOTEL TIME. INDIVIDUAL PLANS MAY VARY. SEE PLAN DISPLAY FOR MORE INFO. CERTAIN TIMES OF THE YEAR A CREDIT CARD GUARANTEE WILL BE REQUIRED.